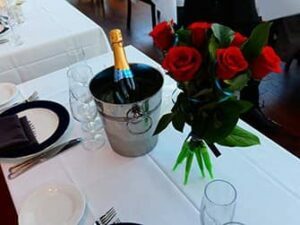 Taking your loved one to New York in February is special, treating them on a Valentine’s Dinner Cruise on Valentine’s Day, even more so. Enjoying a delicious dinner with a backdrop of the night lights of Manhattan’s skyline – the perfect way to impress your date! Spend your romantic night sipping fine wines, cuddling outside on the large outdoor sundecks and listening to classic romantic ballads. Or, if you want to loosen up, dance the night away with the dance hits played by an onboard DJ. Would you like to receive an email as soon as the tickets are available? Send me a message at eric@newyorkcity.ca and I’ll email you when the tickets are available. This cruise is the perfect choice if you’re looking for a romantic night out in New York on Valentines Day. Once seated on the yacht you will receive a complimentary glass of bubbles, starting your date as you mean to go on. During the evening, the boat will cruise along the Hudson and East River, offering you amazing views of the Manhattan skyline. Romance guaranteed! After purchasing, you will receive a voucher that you can print out and use as your ticket for the boat tour or show on your smartphone as a mobile ticket. 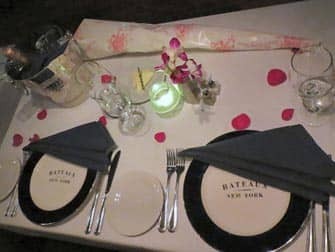 Spend your valentines evening on my favourite boat, the Bateaux! 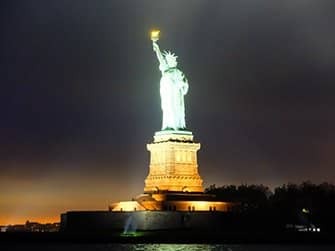 Valentines day is the perfect opportunity for a romantic dinner cruise on this boat, where, due to the panoramic windows, you get a fantastic view of the illuminated skyline of Manhattan. Enjoy a three course meal, a champagne toast and a romantic rose. There are also upgrade options available, such as a guaranteed table by the window. Dress code: Shirts for men (preferably with a jacket). For women, a dress or elegant clothing. Dark, smart jeans are permitted. No casual jeans, t-shirts, shorts, trainers or flip flops. Age restrictions: Children under 6 are not permitted on this cruise, no discounts are applied for children. This cruise is not a dinner cruise, but rather a more budget friendly option for Valentine’s Day. Sip on some sparkling wine from the open bar, while admiring the Manhattan skyline at night. A box of chocolate covered strawberries, cookies and a brownie are included with this cruise, so romance guaranteed! See all the sites of New York by bus! Buy discounted tickets and skip the queues!